A sower went out to sow… This is perhaps one of the best known of Jesus’ parables. It is one of the few parables that appear in all three Synoptic Gospels (Matthew, Mark 4:1-20 and Luke 8:4-15) and in the non-canonical Gospel of Thomas. 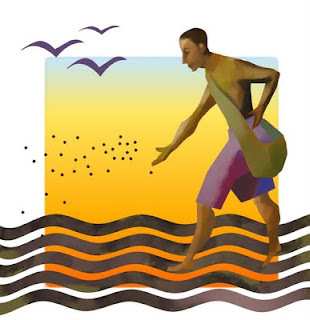 Jesus even names this parable – “The Parable of the Sower” – which should give us a strong hint as to where the meaning lay. But in the course of my preparation I read (skimmed) a number of other articles and commentaries about this parable and discovered that some have come up with another title for it: “The Parable of the Soil.” And this 2nd title reflects one of the major struggles with interpreting Jesus’ parables, namely: we want the parable to be about us! We are so self-focused that when we read the Gospels we want them to be a mirror that reflects us, and of course we want the interpretation to be that we are the good soil – of course. Everyone else, all of those sinners; those who are not like me – well, they are those other kinds of soil. We want to be the good soil! But the parable is not about us. The parable is not even about the soil. Jesus’ title given in verse 18 should be a major hint: “The Parable of the Sower.” This parable is about the sower – God. God is the sower. And like many of the other parables that depict God as not altogether competent (in our human definition of that word “competent”) God is actually not very good at sowing. Jesus’ listeners would have known how to sow. They would have known that you don’t just throw the seed here and there and everywhere in a disorganized kind of way. Seed was expensive and so a farmer needed to take some care in how the seed is sown. Not God. But the picture we have is of God, the sower, throwing the seed everywhere. And I mean everywhere! The seed is not sown only in Israel, among God’s chosen people; the seed is not sown only among the elite Pharisees and those with means; the seed is not sown only among those who carefully fulfill all of the purity and ritual regulations. No, God throws seed everywhere – among everyone. No wonder there is such a negative discussion between the parable and its explanation in the Gospel text. Even Jesus’ disciple’s didn’t want to hear that God was sowing the Word among those other people – the poor, tax collectors, sinners, Gentiles and other who are not like us! And what is this seed? Jesus tells us in his explanation (vss. 18-23) that the seed is the word. The Greek word used in this passage by Matthew is LOGOS. Sound familiar? John 1:14 = And the Word (LOGOS) was made flesh and dwelt among us. The seed is the word which is Jesus himself. Jesus is the word of God incarnate. The Kingdom of Heaven comes into our world through Jesus – the Word. God, the sower, is throwing the Word everywhere. And everywhere it lands it grows. This is where we enter this parable. The soil represents those who hear and experience the Word of God and the reception this word receives. But we don’t get to choose. Does soil get to choose whether or not it is good soil or not? No and neither do we. In fact, we as individuals and as a community represent all of the soils together. We are the soil which is hardened and from which the birds eat the seed, we are the rocky soil, we are the soil which nurtures weeds and thorns and we are the good soil from which God brings forth a harvest, for ultimately it is God that gives the growth. So what do we take away from this parable? It is about God, the sower, who sows the Word, which is Jesus incarnate. The Word is sown everywhere, among everyone and God brings forth growth in every instance. May we recognize the seeds of the Word that grow among us and may we be open to the growth which God brings forth from us.